RENCH ONLY ‘Le bonheur de lire’ offers a fun and catchy gameplay. 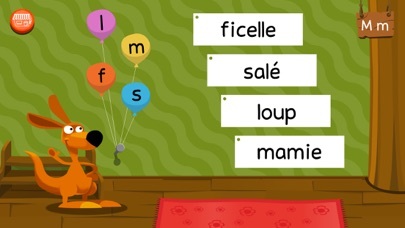 The child is immersed in a small village where cute animals invite them to learn how to read French words. A visit in the store allows him to select the next word to play with. Exercises are chosen by an artificial intelligence. The more you play, the more it is difficult. It's also possible to give to the child words that he is asking for through a dynamic recording system. After a series of challenges summarized in a progress bar, a gold coin is given to buy the next word. It's also possible to improve the learning experience by directly accessing the exercises from the menu, or by clicking on the chest that stores all collected words. Descriptions of the games: WORDS I KNOW This essential game features 3 different levels to help the child to visualize and memorize a new word. 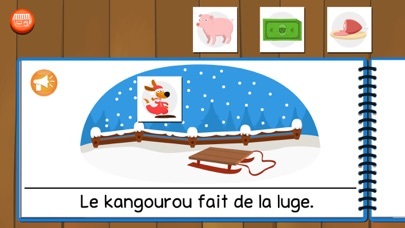 THE SOUND OF LETTERS The kangaroo invites the player to correctly identify the sound of the first letter of a word. 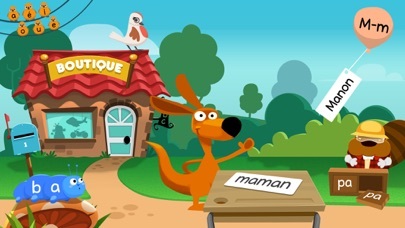 With letter/sound associations, the child is be able to start comparing his words: ""maman", it’s like "marelle"? " 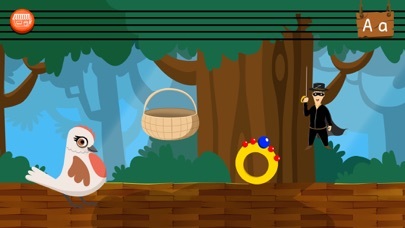 THE LETTERS ARE SINGING A bird is singing different vowels (a, e, i, o, u, é). First, the child drags a vowel to complete every words he sees and understand that all sounds are the same, even if the words that contain the vowel are different. Then, he touches all pictures to hear the word and drag the right one on the wires. THE COLLECTIONS It’s time for the squirrel to play. 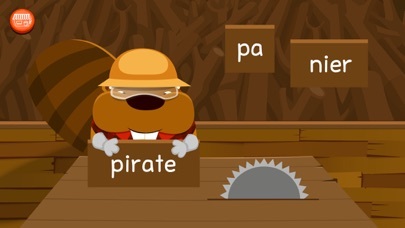 There is also three levels in this game in which children have to associate the right phoneme to the right grapheme. He plays with sounds like "ou", "ette", "an" ... WORD PUZZLES The beaver is waiting for the player to come in his sawmill. He shows him how to cut the words into syllables and then, he invites the child to assemble the pieces to restore the original words. After, the player must select a syllable between four propositions. MATCHING LETTERS The caterpillar and the butterfly ask players to test their knowledge by assembling vowels and consonants to form syllables, always by listening to the audio instructions. This is the famous b+a = b. FEATURES: > 6 unique, multi-level games targeted to specific reading skills > Multi-user interface > Pedagogical content developed with a renowned expert in early reading, Françoise Boulanger, and put to life by our team of teachers, video game designers, and programmers. > Personalized and customizable play > Real time dashboard to track progress > Bright, colourful, and encouraging characters > Clear, concise instructions > Universal app for iPad, iPhone and iPod Touch > Secure gaming environment: No ads, no external links, no in-app purchase, no social media access, no personal information request CONNECT WITH US! If you have any support request, please write at support@edokiacademy.com or visit Edoki Academy Online Community at edokiacademy.com.